Our Cinnamon Hazelnut Cream, naturally-flavored, gourmet coffee is a great-tasting way to enjoy a sweet, creamy cup of coffee any time of the day. Ground Coffee. Unlike other flavored coffee’s made from artificial sweeteners, Cinnamon Hazelnut Cream is made from pure, natural ingredients, that help you stay healthy and energized. 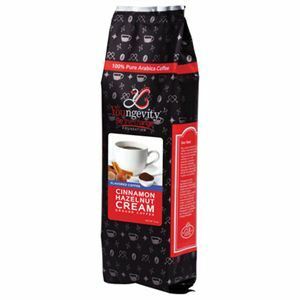 This flavored, gourmet coffee blend provides you with a delicious cinnamon hazelnut taste, adding a sweet aroma to your morning cup of Joe and providing healthy energy levels for any time of the day. Youngevity’s Be The Change Coffee is grown and harvested at our very own plantation in the high-mountainous region of the Nicaraguan rainforest. It is grown under the strictest standards ensuring the best 100% Pure Arabica, Rainforest Alliance Certified™, Fair Trade Certified™, and environmentally-friendly coffee is produced.